FM Stephen Muhammad at the 2003 U.S. Chess Championship. Photo by Daaim Shabazz. 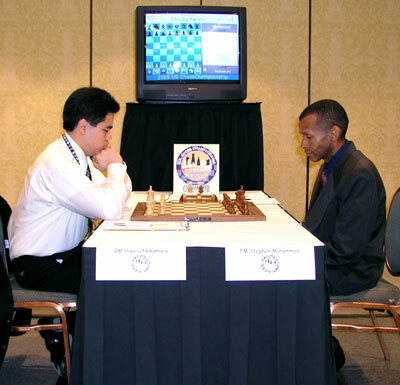 IM-elect Stephen Muhammad faces eventual winner Hikaru Nakamura round 1 of the 2005 U.S. Chess Championship. Photo by U.S. Chessmaster Championships. FM Muhammad qualifies for U.S. Championship at Chicago Open!! ChessBase.com features article on Ashley & Muhammad! For his spectacular performance, Muhammad earned his 3rd IM norm and thus, the title. His return to the U.S. Championship was every bit as notable as the first. 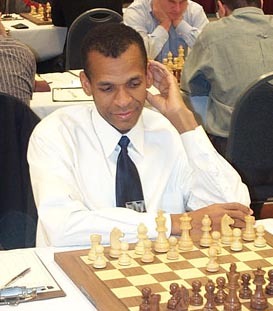 With his perennial GM performance at the World Open, Muhammad would become the first player of African descent in history to qualify in consecutive years. Muhammad's historic appearances will remain as an indelible mark in the annals of chess history and will provide inspiration to many who seek to strive for chess excellence. Stephen Muhammad Qualifies for U.S. Championship!